Figure 5.4 shows the level of qualifications by local authority across Devon in 2014. 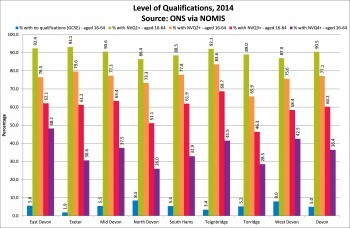 The local authorities with the highest proportion of people with no qualifications were in North Devon and West Devon and the lowest in Exeter. 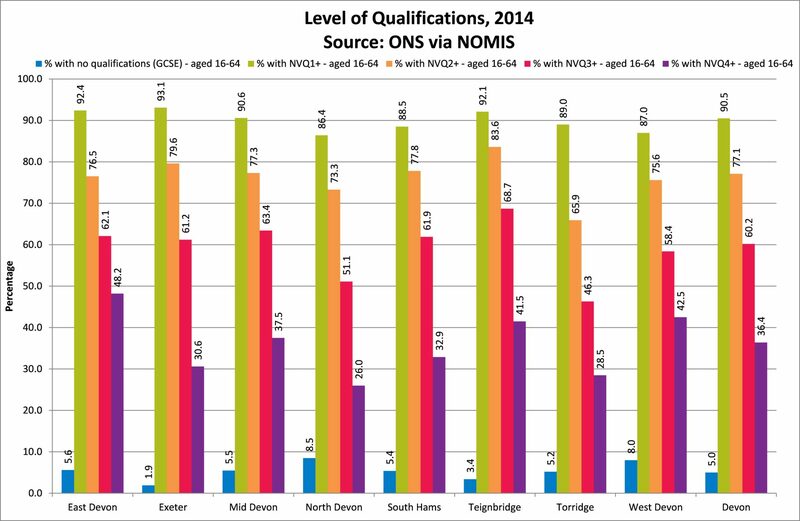 East Devon, West Devon and Teignbridge have the highest proportion of NVQ4+ (equivalent to HND or degree and above). West Devon has an interesting population mix of high proportions with high qualifications, and high proportions with no qualifications, due to a mix of service and agricultural work within the district and relatively high levels of professionals commuting to work in Exeter and Plymouth.